Las Vegas, Nevada - Patriot Gold Corp. (PGOL: OTC), a gold resource and exploration company, today announced that an independent evaluation has established its Moss Gold-Silver Project as a National Instrument 43-101 compliant 590,400 ounce gold (Au) equivalent resource. The independent resource evaluation was completed by Scott E. Wilson Consulting, Inc., a Denver, Colorado engineering firm. The resource estimate was based on 53 channel samples and data from eight trenches and 288 exploration drill holes, which included 59 drill holes that were part of Phase 1 infill drilling conducted by Patriot Gold's project partner, Northern Vertex (TSX.V:NEE), a Canadian based gold exploration and development company. The complete technical report is expected to be filed by early December. "Clearly the new resource estimate is a testimony to the success of our recent 27,000 foot, Phase I drill program on Moss," said Dr. Bob Thompson, Chief Geologist for Northern Vertex. "We could not be more pleased with the conclusions returned from the independent resource study. Not only have we met our objectives and established a substantial gold-silver resource, upcoming drilling on the western extension of the resource offers significant potential for even further resource expansion. This is an area where an extensive, previous surface sampling program by Northern Vertex returned promising gold-silver values extending an additional 1,135 feet on strike and beyond the current 43-101 resource." 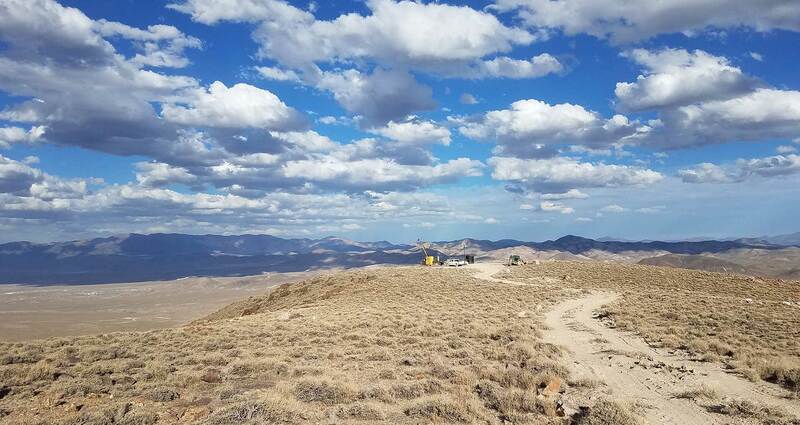 "The independent study by Wilson Consulting further validates our belief that the Moss project site has significant potential as a substantial, near-term gold-silver producer," said Bob Coale, CEO of Patriot Gold. "We are extremely pleased with the results achieved thus far by Northern Vertex and look forward to making additional progress on this project as we pursue baseline and scoping studies and Phase 2 activities that will move us closer to a production decision." Additional infill drilling to render 'inferred resources' into the 'indicated' category, scheduled to begin in November 2011. Continued scoping and baseline studies to advance the permitting process. Comprehensive metallurgical testing to determine precious metal recoveries. Commencement of a multi-phase 25,000 foot drill program to test the western extension of the Moss deposit. Preliminary pit design for open-pit, heap-leach mining. Initiation of environmental impact and feasibility studies. The Moss Mine Project is situated in the historic Oatman Mining district in northwestern Arizona. Since announcing the joint venture project with Northern Vertex in March 2011, the project has completed 59 drill holes through reverse circulation and coring techniques. The Moss deposit is a low-sulfidation epithermal stockwork deposit with a strike length in excess of one mile. National Instrument 43-101 (or NI 43-101) is a codified set of rules and guidelines for reporting and displaying information related to mineral properties owned by, or explored by, companies which report these results on stock exchanges within Canada. The NI 43-101 requires that companies traded on the Canadian stock exchange provide technical reports conducted by an independent source to provide information on mineral resources. The information is provided to ensure that misleading, erroneous or fraudulent information relating to mineral properties is not published and promoted to investors on the stock exchanges overseen by the Canadian Securities Authority. Disclaimer: This announcement may contain forward-looking statements which involve risks and uncertainties that include, among others, limited operating history, limited access to operating capital, factors detailed in the accuracy of geological and geophysical results including drilling and assay reports; the ability to close the acquisition of mineral exploration properties, and other factors which may cause the actual results, performance or achievements of the company to be materially different from any future results, performance or achievements expressed or implied by such forward-looking statements. More information is included in the company's filings with the Securities and Exchange Commission, and may be accessed through the SEC's web site at http://www.sec.gov.